* After the first two adults, are any passengers 12 years or younger? A quick and affordable getaway. This is the only 2-night cruise sailing from the Port of Palm Beach to Grand Bahama Island every single day of the year. This fun 2-night getaway makes you the captain of your amazing experience. Best of all, we set sail every single day of the week, so we’re ready to go whenever you are. 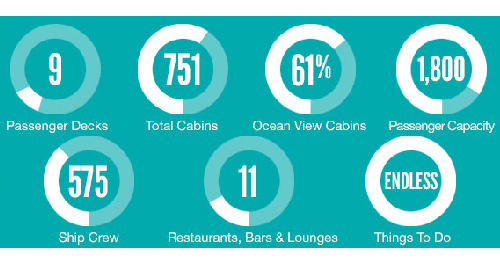 Our ships are packed with fun and activities for everyone. The moment you board, you’ll never be bored. Dance under the stars, or really wherever the moment strikes, because everyone else will be dancing, too. Dine to your heart and stomach’s desire as you pair your meals perfectly with your favorite handcrafted cocktails. Let the freedom and relaxation of the sea come to life as you enjoy a treatment in the spa. Roll the dice in the casino and own the night. Sit back and enjoy amazing live entertainment, from Vegas-style shows to late-night comedians. And as we stop at Grand Bahama Island, the fun is just starting. Explore the island, enjoy the beaches or just shop for that perfect tropical souvenir. It’s all waiting for you. The Grand Celebration and the Grand Classica offer traditional 3-day cruises to Grand Bahama Island departing every single day from the easily accessible Port of Palm Beach. These spectacular ships have a maximum capacity of 1,800 passengers and include all of the excitement, on-board amenities and fabulous entertainment options you would expect from a long duration cruise without the high price. You'll see why the Grand Celebration and the Grand Classica have quickly become two of the most popular cruises available. Call (800) 991-0623 and speak with a travel specialist today if you have any quesitons. The 2 Night Bahamas Cruise requires a valid passport, U.S. passport card or a U.S. Birth Certificate with a government issue photo ID (driver's license). Children 15 & Under may use a certified birth certificate to travel. The Grand Celebration is quite-a-step up from the old Celebration cruise. It's much larger and much newer. We like this little cruise and have also taken the cruise & stay package, combining 2 nights at the Viva resort in the Bahamas...great deal! Click the button below to add the 2-Night Bahamas Cruise | Grand Bahama Island to your list and contact a travel agent.